Browse:Home Wilnoteka The parents of the students of the Lelewel School are worried – when will the renovation be finished? The parents of the students of the Lelewel School are worried – when will the renovation be finished? “The authorities of the city have promised that the renovation will be completed on August 26 but we see that it is an impracticable date. For now, none of the classrooms is ready” informed Wilnoteka Beata Bartoszewicz, a mother of one of the students of the Lelewel High School in Vilnius, also the chairperson of the Committee for the Defence of School. On Tuesday, the 16th of August, a group of parents met with the vice-mayor of Vilnius Valdas Adamkus Benkunskas, who came to inspect the process of the renovation of the school. “We still do not know how is it going to be regarding the beginning of a new school year. Even though the renovation is in progress, the chances for its completion before the 1st of September are small. Not even mentioning the promised August 26th. We have talked about this with the vice-mayor. Mr. Benkunskas have been assuring us that the construction workers will finish on time but it is hard to believe. Anyway, already now it is known that the sports hall will be renovated only in September or in October. 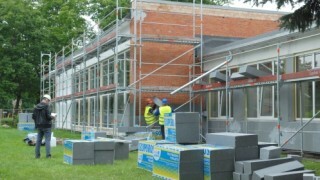 The canteen will be ready before September but the renovation of the assembly hall, which is connected with the canteen, will take place during the school year – I do not know what do the hygienists have to say about that. The front door was supposed to be replaced also during autumn, but most likely those are to be mounted earlier” – Beata Bartoszewicz informed Wilnoteka. “We understand that the weather is working against the construction workers, we have heard that they are working even on Saturdays, but a recent fire in the distribution board worries us. There were no huge losses but it surely affected the pace of work” -she added. The representatives of the Committee for the Defence of School have been adressing the vice-mayor Valdas Benkunskas already at the beginning of August, asking for a meeting and a conversation about the renovation. However, his consultant informed that the vice-mayor was busy and proposed contacting the vice-mayor in writing. “I have found out accidentally about the fact that the vice-mayor will come to the school on Tuesday afternoon. First of all, I was alone, then a few more parents joined me. Mr. Benkunskas stood pat: they will finish on time” – told Wilnoteka Beata Bartoszewicz. The Committee for the Defence of School addressed a letter to the mayor of Vilnius Remigijus Šimašius, asking for a meeting and a conversation. “The new school year is coming. We are getting really concerned. We are considering the possibility of relocating from Antakalnis to Žirmūnai but on the condition that the building at 3 Minties Street will be renovated. We will not go in there before the renovation is finished” said Beata Bartoszewicz. The decision about relocation of the Polish school from the Antakalnis to Žirmūnai was made last summer (2015) by the city council by the votes of the liberal-conservative coalition which rules the capital, subordinating the approval of the accreditaion upon the “relocation”. First of all, the authorities of the city did not allow the school to start the process of accreditation because, allegedly, it did not meet the requirements. What is more, a decision to downgrade the school was made. Instead of Lelewel High School it was supposed to be only a primary school from the 1st September 2015. Suddenly, however, the authorities have changed their minds. Summer 2015, during school holidays, the vice-mayor, conservative Valdas Benkunskas personally went to the high school with an ultimatum: the city authorities will allow the accreditation if the school changes the location from Antakalnis to Žirmūnai. The school community treated such an ultimatum as a blackmail and turned to the Court. However, the court aligned with the local government. The authorities of the city have promised that the building at the Minties Street will be completely renovated. The local government has allocated 2.3 million euros for the renovation of the school. Though, the renovation was started only in July.